Don’t miss these great herb gardening coupons and deals from some of our go-to seed & garden supply websites such as Botanical Interests. Plus another of our long-term favorites for food & hostess gifts – Harry and David. Enjoy! 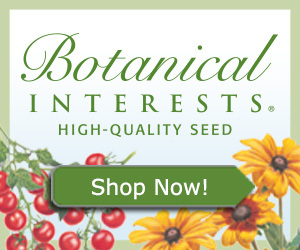 Botanical Interests is a favorite for high-quality garden seeds. The company was founded with the intention of helping to not only provide their customers with a high-quality product but also to educate them on how to get the best results in planting. The Botanical Interest seed packets are well known for the beautiful artwork on each as well as the detailed growing instructions often lacking on many of the big-brand packets. The Botanical Interest’s website boasts a whopping 170 varieties of organic seed as well as many heirloom varieties. The selection of herbs is nothing short of excellent. You will find many unique varieties on their website and catalogs such as Triple Curled Parsley or Shiso Perilla aka the Japenese Basil. They also create unique custom blends of herb seed such as the Basil Custom Blend of Heirloom Seeds that include: Lemon, Cinamon, Thai and Genovese Basil – plus a few more. And don’t miss Botanical’s line of gardening supplies from scented gardening soaps to the fun Paper Pot Makers. Need a quick gift for a gardening buddy? 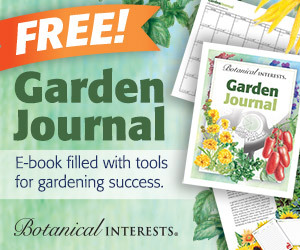 You can print this free online garden journal & give it to a friend or enjoy it yourself! View the PDF using the link below & print it right at home. Everyone is always on the lookout for hostess gifts and tantalizing treats to enjoy with friends and family. Harry and David is well known for their unique selection of gourmet gifts. Send a holiday greeting with a harvest gift basket complete with savory pear chutney, apple loaf cake, fresh fruit, and cookies. Or make your sweetie smile with some divine chocolate truffles or sea salt caramels. Gift baskets are not just for the holidays either. Welcome someone to the neighborhood with the Ultimate Pantry Essentials gift box or brighten a loved one’s day with the Favorite Gourmet Foods Trunk. When you choose a gift from Harry and David, you know you are sending the highest quality treats that are sure to delight your friends and family. Visit their website today to find the latest coupons.